Our kit is offered for 1967-1979 Ford ® 4x4 trucks only at this time, one or two guys have used it in 2-wd trucks before and had some challenges with clearance problems between the engine block and the twin I beam suspension brackets. You will need to do some cutting on your radiator support and also on your grille to allow the intercooler to be installed. Some banging on your firewall with a hammer to make some more room for the valve covers and exhaust is also necessary. Modifying the frame cross member just behind and under the radiator is also required for 6-cylinder Cummins ® conversions to allow the engine to sit lower in the frame. Trimming the back side of the grill an inch or two to properly fit the intercooler is also required. These modifications can be a challenge for some, but not too bad for most skilled mechanics. C-6 - Lack an overdrive and a locking torque converter. Your power transfer, top speed and fuel economy will suffer greatly. DCS does not recommend using this transmission under any circumstances. E4OD & 7.3L 4R100- If you are planning on doing constant heavy pulling or adding a lot of performance upgrades to your Cummins you may want to have your transmission rebuilt with aftermarket parts. When using a 7.3L diesel E4OD/4R100 you'll need a Ford 6.0 diesel starter, which does not require any grinding of the transmission (12 or 24 valve engines only at this time). This adapter plate uses the stock Dodge Cummins flexplate and a torque converter adapter. The plate has to be tilted just 2 ½ degrees to accommodate the starter without any grinding to the transmission or starter. These transmissions are electronically controlled. We can provide two styles of transmission controllers for these transmissions. The Compushift controller does not require a laptop computer. See our Automatic Transmission Controller for more information. When using the Compushift aftermarket transmission controller, you may have to upgrade to newer E40D components that are compatible with the controller. 5R110- The 5R110 is not considered a "conversion friendly" transmission due to the limitations of aftermarket transmission control modules. It's not recommended to use this transmission outside of it's original application. A few things you need to know when using this transmission is that you will need a Windows© laptop computer to work with us to get the final shift tuning just right. We pre-calibrate your transmission controller according to your tire size and gear ratio as close as possible before we send you’re the PCS controller, and after you get your truck running, we are available to help you learn how to data log the transmission shifting and receive edited calibrations from us via e-mail. Be prepared that when you first get your truck running the transmission may not shift properly and tuning can take several days, exchanging 10 or more data logs for edited calibrations. You also need to know that you will lose the tow / haul features that the 5R110 transmission has in the original equipped trucks, such as higher shift points and engine braking in the tow / haul mode. The tow / haul switch simply becomes a cancel overdrive switch. Ford ZF 5-Speed – Although this transmission did not come as original equipment in these years it can be used in these trucks as we make Adapter Plates for these transmissions as long as they were behind a 7.3 diesel or a 460 big block. This transmission was introduced in 1987. It is rated for 420 ft. / lb. of torque. The 1995 and newer transmissions are rated for 470 ft. / lbs. of torque. Ford ZF 6-Speed – Although this transmission did not come as original equipment in these years it can be used in these trucks as we make adapter Plates for the 7.3 and 6.0 diesel 6-speeds. WE do no currently make an adapter to the V10 6-speed. Ford started using this transmission in 1999. They are rated for 520 ft. / lbs. of torque. Using one of these transmissions is possible in your 1969-1979 Ford by modifying the transmission cross member and floor. In some High Boy models it has been reported that the substantial size of this transmissions has required frame modifications to make the transmission and transfer case fit. We have transplanted the ZF 6-speed into 1990's era trucks. If you have a fuel tank directly behind the transmission you also have to hammer one end of it to make room for the 6-speed transfer case if your truck is a four wheel drive. We recommend using the 03-07 ZF-6 in a swap as no grinding to any part of the engine, transmission, or starter is required. This transmission BIG! You will have to make modifications for proper fitment. NP 435 / T-18 / T-19 4-Speed - We do not recommend using one of these transmissions behind a Cummins, but it is possible if you insist. The 435 is identified by the aluminum shift tower. The T-18 and T-19 both had cast iron shift towers. The T-18’s have a casting number of 1301 on the transmission case. We can adapt to these with our custom Flywheel and Adapter Plate. You MUST use a bell housing from a T-19 (case number 1309) from behind a 460 or a Ford diesel 6.9 / 7.3 for the necessary clutch clearance (if you don’t already have one). The 6.9 diesel T-19 bell housing is ideal! You will need a 12” clutch disc and pressure plate for a Ford diesel 6.9 / 7.3 that has a T-19. Keep in mind without an overdrive your top speed can be very limited, and although these transmissions have a reputation for being tough, they are not as tough as the new ZF transmissions because of their smaller input shaft. Diesel Conversions ® Adapter Plates for the original equipment transmissions in these years require transmission bell housing modifications for starter clearance. The automatic transmission adapter plate requires our torque converter adapters and use the Dodge flex plate. For manual transmissions, the appropriate Dodge Cummins Flywheel is needed. These adapter plates use the Cummins starter. The adapter plate replaces the adapter already on the back of the Cummins engine, making a factory quality connection for the transmission. They are precision machined from aircraft grade (6061) aluminum. More detailed and specific information on our adapter plates can be found on our product pages in the parts catalog or by following the links in the kit builder. Currently, we only offer engine mounts for the 4-wheel drive models. The engine mounts are designed to use an existing hole in frame when the transmission is moved back and the engine driven fan is used. You will have to drill out the cage nut in the hole the mount uses. Some of our customers choose to leave the transmission in the stock location and use electric fans; we do not fully recommend this as we do hear back from a few that have overheating problems. It probably doesn’t save you any money or time in the long run, but it is possible if you would prefer, although you will have to drill new holes in your frame. The transmission and transmission cross member both need to slide back for the engine driven fan to have radiator clearance. Depending on the transmission used, the cross member may need to be reshaped and restructured as well. If your truck is a Highboy, it will use shorter motor mounts as the frame is narrower in these trucks. We will ask you to measure the distance between the bolt holes used in your frame when you get the stock engine out so that we can make sure the mounts we send are right for your application. 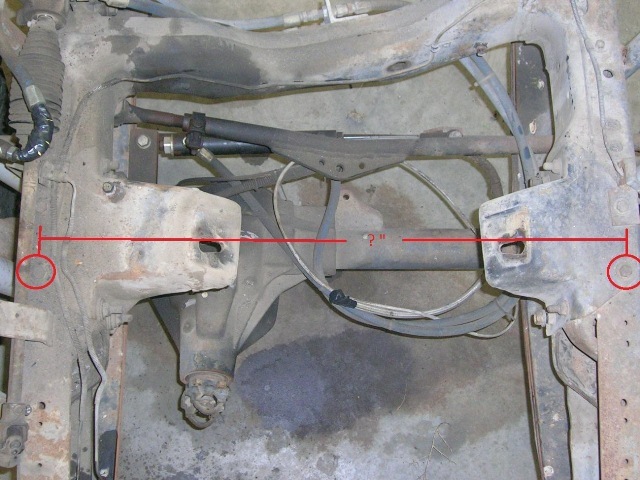 See the picture below, measure from center to center of the rear-most bolt (shown in the red circles) that holds the Ford engine mount perch on the frame. The engine must be removed to get an accurate measurement. We offer the adapters to put your Ford gauge sending units into the Cummins engine so that your factory gauges will work with the Cummins engine, and other basic fittings are also included for your power steering pressure and return line. It's not anything you can't get at your local hardware store, but it should save you a trip or two to town. Our external alternator regulator kit to use the Dodge ® Cummins alternator (includes a regulator, wire pigtail, and instructions), was designed for Dodge alternators. Some trucks in these years already have an external regulator that can be used, but it does not work as well as the one we offer- dimming headlights etc. are common issues with them. If you are using the stock Ford radiator, you will need the upper water neck and the alternator bracket that must be used with it. The water neck is needed for radiators that have the upper hose connection on the passenger side of the radiator. If you plan to use the Dodge Radiator or other radiator having the upper hose connection on the driver side, you will want the new style water neck that points to the driver side (1994 + OEM Dodge Cummins). Our conversion friendly manifolds work much better in the conversion for the 12-valve and 98.5-02 24-valve engines. These manifolds place the turbo in a better place for a/c component clearance than the stock variety, and also make exhaust and turbo oil drain connections easier as well. The conversion friendly manifolds improve air flow over stock and are 2-piece to prevent cracking. When using a 12-valve engine for your conversion with one of our manifolds it is required that the housing of the turbo be re-oriented so oil feed and drain are vertical. Once the housing is re-oriented, the waste gate actuator will interfere with the engine block. To remedy this issue, we offer a conversion friendly waste gate actuator kit (DCS Part Number 3048) to fit the H1C and HX35 Turbos that came factory on the 12-valve engines. When using a 24-valve engine for your conversion with one of our manifolds we recommend upgrading to a 2003-2004 Common Rail or similar style turbo . Due to the design of the waste gate actuator on the stock 24-valve turbo it makes it difficult for the housing to be re-oriented. Using a 2003-2004 common rail turbo alleviates this issue. Along with replacement manifold gaskets, hardware, and turbo mounting studs, we also offer a flexible turbo drain tube that connects to the stock hose and elbow that is left in your engine block when the stock drain tube is removed. The flexible drain tube makes for an easy connection to the re-oriented turbo housing. The tach kit consists of three parts; the Mounting Bracket, Sensor, and Tone ring. These parts are necessary to make your factory tachometer work. Providing this signal to your Ford PCM computer also is necessary for the air conditioning, transmission temperature, and other gauges to function properly. All trucks in this era require the tach ring that bolts onto the front of the Cummins crankshaft balancer for the sensor to send the correct signal pulse which makes the tachometer work, if so equipped. It is not necessary to buy a diesel instrument cluster for your truck. This includes a Brute Force air filter, pipe, and flexible rubber hose to connect to your turbocharger. This kit works well when moving the passenger side battery to the driver’s side. This manifold bolts to the back of a 1994 and newer Dodge A/C pump, making the A/C plumbing less of a challenge. All you will need to do is have some new hoses crimped between our manifold and your Ford pieces at the drier and evaporator. When using these pumps in these trucks it is required to do some cross member modification. We can also provide you with radiator hoses, along with a custom bent lower hose connector tube. The hose kit that is offered in the kit builder for these trucks only works with the stock style Ford radiator, new style lower water connection, and our upper water neck kit. See our Cummins Engine Information page for more information. INTERCOOLER - Any Super Duty ® diesel intercooler can be added to your truck. Welding and cutting is required. There are some rare versions of the Super Duty intercooler that have one neck that angles out instead of straight back – stay away from this one. The 1993 Dodge intercooler and radiator is also an option. ADDITIONAL BATTERY - Not completely required, but certainly not a bad idea. LARGER RADIATOR - The 460 or Diesel radiators are recommended for extra cooling capacity. Stay clear of any radiators that have X braces in between the radiator and the engine; and also any that are 37” wide. INTERCOOLER PIPES - Usually modified Dodge pipes work or you can bend them from scratch. CONSIDERING HAVING US DO THE CONVERSION? Contact us today to get an estimate. We have an international airport for air travel. We can make shipping recommendation if you would rather have your truck shipped out to our shop. This information is provided to you to help you make an informed decision on your conversion. If you have any questions do not hesitate to CONTACT US. *Diesel Conversions ® is not affiliated with Cummins, Ford, or Dodge. Our use of these and other registered trademarks is for descriptive purposes only.